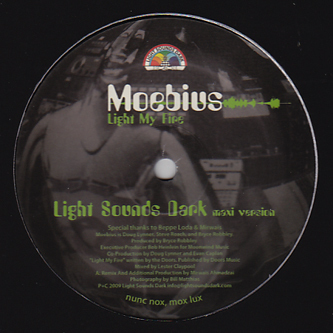 Light Sounds Dark Records present a cult disco classic from LA synth-band Moebius (no, not the Cluster/Harmonia dude) originally released on Moonwind records circa 1979. 'Light My Fire' is an ahead-of-its-time cover of The Doors classic, giving it a thorough overhaul with throbbing arpeggiated bass and the sort of futuristic vibes that earned it a place in Beppe Loda and Danielle Baldelli's boxes back in the early 80s. 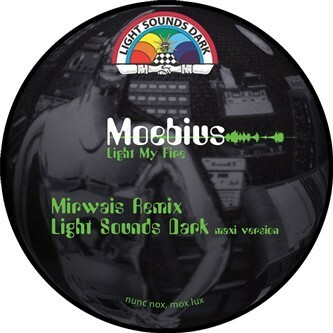 Backing up the extended 'Maxi Version' from the Light Sounds Dark crew, French disco veteran Mirwais steps in to give it a proper remix, dipping the vocals in some secret ingredient and tailoring it with an all-in-one electro-disco jumpsuit to enhance the dancefloor potential for 2010.